Maria Montessori was an Italian educator who developed the educational approach "Montessori Education". Now, worldwide more than 20,000 schools follows her educational educational system. She was the first female to earn the distinction of a doctor of medicine in Italy. Maria Montessori born on August 31, 1870 in Chiaravalle district of Milan, the second largest municipality in Italy. 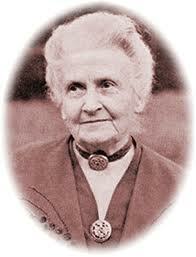 Her father Alessandro Montessori, was an employee of tobacco factory and her mother Renilde Stoppani, was an geologist. Her full name is Maria Tecla Artemesia Montessori. Maria Montessori got only one male child named Mario Montessori. In 1876, at the age of 6, Maria Montessori joined a public elementary school in Florence, the capital city of the Italian region of Tuscany. Then at the age of 13 she joined a technical school where she learned science. Then at the age of 20 she got certificate in physics graduation. Later she studied medical science. Initially she was discouraged by some university people but later she was enrolled in the University of Rome and completed her education with good results. She was the first female from italy to get doctorate in medical science. After graduation, Montessori does her research on education system. She works with mentally disabled childrens as well. She wrote several articles about creation of special training institutions for mentally disabled children. In 1900 she become the co-director of Orthophrenic School, where she implemented and developed the "Montessori Educational System". As it attracts government officials it was spreaded over the schools and become a successfull educational system. Then it start spreads all over the world and currently more than 20,000 schools in the world runs on this educational system. Maria Montessori died on 6th May 1952 in Noordwijk town of western Netherlands.